As I mentioned in my last blog, I am currently spending a considerable amount of time in the fourteenth century. This has allowed me to indulge a number of obsessions, including the entymology of words and, my real love, food and the development of our culinary heritage. These two things are very inter-connected. The arrival of the Norman French in the years post the Conquest brought many of our current words into use - in this context, curfew is particularly relevant coming as it does from the signal to bank the hearth fires at the end of the day and stemming from the Latin coverir (to cover) and feu (fire). It also heralded the start of a real explosion in culinary learning as eleventh century Michel Roux Juniors arrived to educate the palates of the English upper classes - I live in hope that there was an equivalent Monica Galetti terrifying young cooks from beneath her wimple. 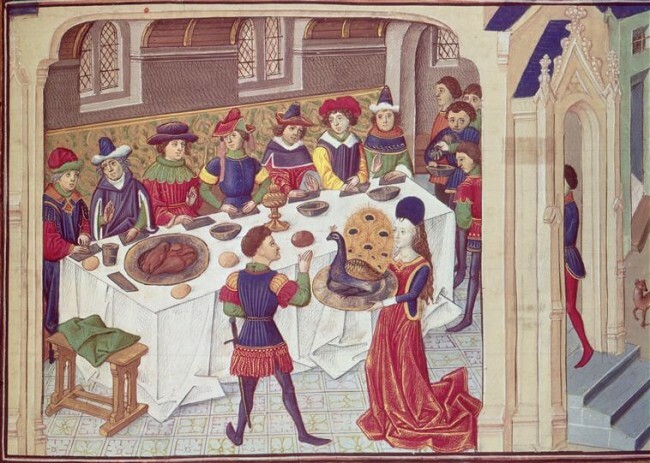 The interest in the culinary arts achieved its peak in the reign of Richard II and has come down to us in the form of a wonderful manuscript known as The Forme of Cury, with cury being the Middle English word for cookery. 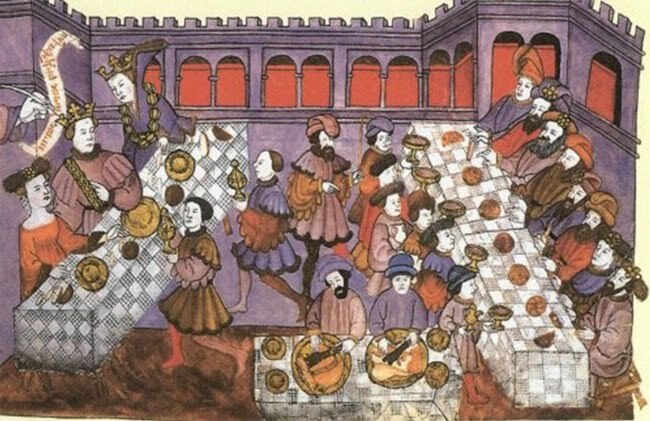 This manuscript is not just a description of meals enjoyed, it is an instructional text: a series of recipes, 196 in total, put together in a parchment scroll by King Richard's cooks so that other cooks could learn their trade. Some of the recipes are for everyday use ('common meats for the household as they should be made, craftily and wholesomely') and some are for feasts. All are fascinating for the glimpses they give us of the incredible range of ingredients available to medieval cooks in wealthy households, the customs surrounding eating and the links drawn between food and other important contemporary disciplines - the introduction says that the work was given 'the approval and consent of the masters of medicine and of philosophy' who served at Richard's court. Everday meats and pottages are one thing, it is the feasts that fascinate me. The recipes are full of wonderful ingredients from olive oil and spices such as caraway and cardamom to more exotic food that even the most hipster twenty-first century restaurant would blanch (pun intended) at - cranes, curlews, herons and even seals and porpoises. Many of the dishes served required a huge array of techniques to prepare them, separating them out from the far less complex roast meats which had dominated in earlier times. 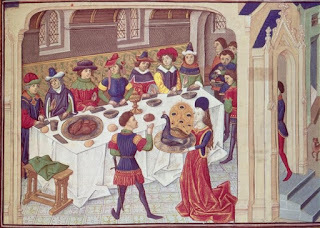 By the end of the fourteenth century, meat would be presented in a wide variety of fashions: mortrews was a type of meatloaf with a base of minced pork and chicken which was boiled and then thickened with bread, spices and eggs and often served with a broth; raysols also used minced meat as the main ingredient (in this case pigs livers), with the addition of cheese and a saffron crust. The list of techniques for tackling meat alone read like something Jamie Oliver might employ with words such as stamp, meddle, smite and seethe littering the recipes. When you think about some of the centrepieces these kitchens produced - such as the cockatrice formed from the front of a capon and the back of a piglet stitched together or the peacocks brought to the table with their bodies and feathers reformed - you have to marvel at their ingenuity. It wasn't just the savoury courses that were astounding. Many of us have heard of the sugar subtleties that heralded each course or acted as warners that the banquet was about to begin. I (perhaps because I am married to an American who was brought up with this tradition rather than the custard approach I knew) am fascinated by the brightly-coloured jellies which were used to encase everything from fish to fruit, which in turn were often gilded. Kate Colquhoun in her wonderful book Taste lists some of the colouring ingredients from blood and bark (reds and purples) through heliotrope (blue), almonds (white) and mint to the glorious and highly-prized saffron. A sea of heraldry for the table. Feasts were an important part of the medieval calendar and we are currently in the middle of one of the key celebrations: Midsummer. Midsummer was the culmination of the spring festivals that heralded fertility, the hopes of a good harvest and the solstice. Its dates have shifted slightly: astronomically the longest day falls on the 20th/21st June but the 1752 calendar alignments fixed the date on June 24th, the Feast of John the Baptist. Whatever the date, Midsummer Eve has traditionally been celebrated with bonfires (originally burning animal bones, hence the name), cooking and decorating with flowers and herbs to entice the fairies and of course, food. Lots of Midsummer recipes involve fruit and vegetables but I honestly think a celebration is not a celebration without cake. 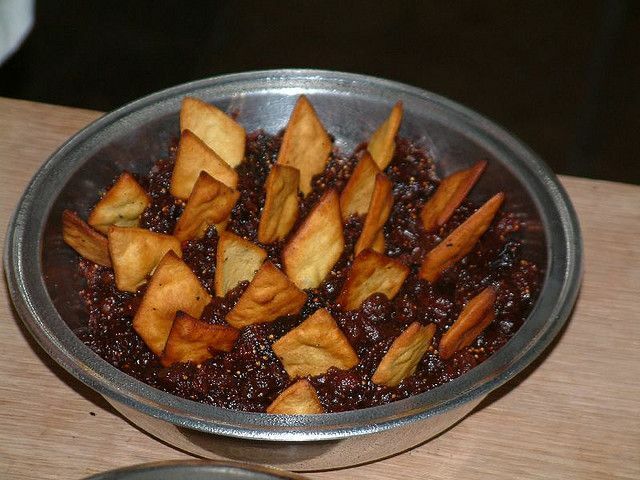 So, here is a recipe for fourteenth century Bryndons - small cakes in a sauce of wine, fruit and nuts -which I think captures the ingredients and the array of techniques our medieval cooks would have employed, even on small dishes. There is a a modern translation of the recipe at a wonderful website called A Boke of Gode Cookery. I really hope to see someone have a go at these on the Bake-Off, I feel Mary Berry would approve. Boil wine, honey, sandalwood, cloves, saffron, mace, cloves, minced dates, pine nuts, currants and a splash of vinegar. Add ground figs that have been boiled in wine and strained. Make thin cakes out of flour, saffron, sugar and water. Slice these thinly and fry in oil. Serve the cakes in a shallow dish, arranged on the boiled and cooled syrup, which should be runny and not stiff. I volunteer to be your taster! I really enjoyed this post - history and food, two of my fave things! I bet a medieval bake off would probably be interesting! How come you don't link to the book, nor to the sources of the images you used? Surely some of your readers would like to follow your journey a little more closely. You can get this book on Project Gutenberg. A fascinating book! And a very enjoyable post. Thank you! I'm here from Talk of the Town! I don't know that I could eat that 'cake'? It's certainly not what we Americans think of when we think of and look at 'cake'! LOL! I think I might have starved in the 14th century! Maybe MANY of the centuries! LOL! My post: Stacking the Shelves, blog updates and week's end w/Giveaways! 7-9-16! Reviews coming this week! Fascinating post Catherine. I love that there are paper trails to many things from the past.